For any HR managers and benefits professionals that prefer to use serviced based heath fair companies for planning health fairs, we put together a list of companies as a resource. Multiple groups have said using HFC is like "online shopping for health fair vendors." There is probably 50 more companies such as these in all metro areas around the nation. And if you have a huge budget, want a theme, attraction (speaker, etc. ), onsite staffing, etc., one of these health fair planning companies might be the right fit for you. 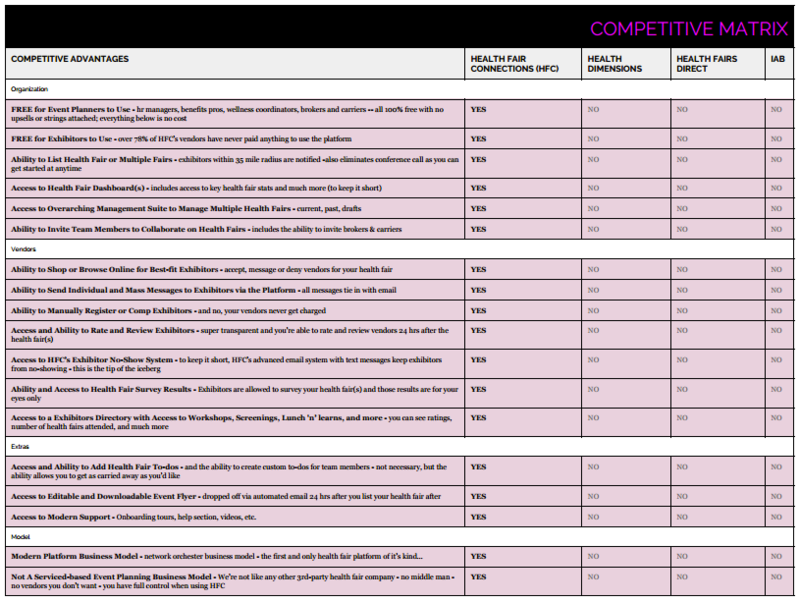 Not to mention, HFC does not consider these health fair companies as direct competition (more like indirect). The biggest competition for HFC is the ignorance of the market - people just don't know about us yet. Either way, the point is you have plenty of options that provide the assistance to host a health fair - either with a 3rd-party or HFC' health fair planning platform. If you're still on the fence, check out this article from Motley Fool: Does Your Company Host Health Fairs? They Should. Please feel free to share this post or leave any comments or suggestions.